Skoda had its largest ever chunk of the UK fleet sales market in 2017, according to new figures from the Society of Motor Manufacturers and Traders (SMMT). The Czech car maker achieved a 3.7 per cent share of Britain’s fleet market last year – a record-breaking proportion for the brand. 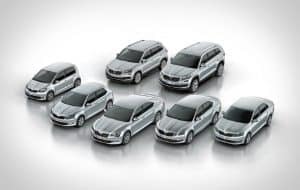 Skoda saw true fleet sales grow by 7.8 per cent in 2017, compared to the previous year, with a 6.8 per cent overall growth, which was made all the more impressive due to fleet sales actually falling for the year in total. This elevated Skoda from 12th to ninth place in the true fleet market rankings – its highest ever position. Skoda’s range has proved increasingly attractive to fleets in recent years, in light of the fleet-friendly qualities of the Octavia, Superb, Fabia and, most recently, the Kodiaq – the brand’s first ever mid-size SUV. However, its success in the fleet market has been helped by a number of new initiatives in 2017 that have kept it front of mind for fleet decision makers. Fleet managers and user choosers now have the opportunity to tour the latest cars, anywhere, anytime, through the Skoda Live Tour – the brand’s first digital showroom. To further support customers throughout the lifecycle of the vehicle, Skoda introduced a dedicated fleet customer service centre and, to ensure consistent excellent service across its nationwide network of retailers, the brand launched a fleet service level agreement. Henry Williams, head of fleet for Skoda UK, commented: “These results reaffirm the strength of the Skoda offering for business customers, and we are delighted to have recorded our best market share to date.